A meeting with British Paul Dugdale, director of the documentaries on the Rolling Stones tour of Latin America and their concert in Cuba, and the screening of 85 films are the highlight today in the program of the Havana Film Festival, which runs until December 18th in this city. The exchange with Dugdale, a multi-award-winning filmmaker based in London, will take place at Sancti Spíritus room of the Nacional Hotel, where it is expected him to talk about the shooting process of the two materials, collected under the general title The Rolling Stones Olé Olé Olé! : A trip Across Latin America. Among the documentaries, Havana Moon-The Rolling Stones Live in Cuba, on the concert of the prestigious British band in Havana, last March 25, attended by more than 500 000 people, creates expectations. Paul Dugdale has directed numerous live concert films by leading artists around the world and has been nominated for Grammy Award in categories such as Video Music. On this second day of the Festival, dedicated to the Cuban filmmaker Julio García Espinosa and the San Antonio de los Baños International School of Cinema and Television (EICTV by its Spanish acronym), 19 Cuban audiovisuals, including long and short fiction films, documentaries and animations, including some coproduced with other countries. The list of these materials includes Esteban, debut film of Jonal Cosculluela Sánchez, which narrates in 88 minutes the story of a nine-year-old boy who wants to be a pianist, despite his sad reality and having no family influence related to music. Una pelea Cubana contra los demonios, a 130-minute-film by the outstanding Cuban director Tomás Gutiérrez Alea, who died on April 16, 1996, appears in contention in the category of Restored Classics, one of the novelties of this edition of the contest. 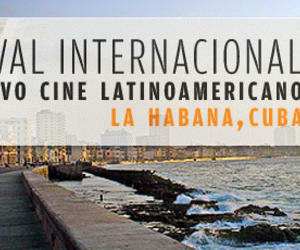 More than 400 materials, classified in long and short fiction films, documentaries and animations, will be exhibited during the next 10 days in the various rooms and circuits of the Cuban capital, including 160 works in competition, 18 of which are fiction feature films and equal number of debut films.